Fall is in the air & soccer season is in full-swing for my kiddos. So my go-to kitchen appliance these days is my crock pot! I can throw my ingredients in the crock pot in the morning, set it & forget it until it's time to feed the brood. On nights when I'm not even sure how we are getting everyone everywhere they need to go...at least I know they will have a delicious, nutritious, home-cooked meal that will be warm & ready to eat, even if we don't all make it to the table at the same time. 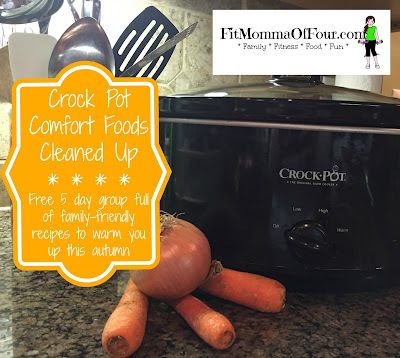 This week I am hosting a crock pot recipe swap over on Facebook where I will be sharing some of my favorite crock pot meals, introducing a few new recipes, sharing some clean eating tips & shopping lists, as well as answering questions about how I feed our busy family healthfully.